How to AirPlay videos movies in any format like AVI, MKV, DivX, FLV, MOV, etc that are not supported by AirPlay from Mac/PC to Apple TV? The world-class 5KPlayer from DearMob provides you with the top solution. This all-conquering AirPlayer server allows users to AirPlay all the popular video formats after conversion from iOS devices and computer to Apple TV and other devices (PC and Mac included), with no loss in the video quality. How to AirPlay AVI, MKV, WMV, FLV, DivX etc with Full Quality? You need DearMob 5KPlayer to easily airplay videos in any formats including AVI, MKV, FLV, DivX and more from computer to Apple TV, including Apple TV/Apple TV2/Apple TV3. Imagine what will you do when you have many friends over and wanna enjoy some amazing videos on your PC or Mac. Squeeze onto the screen and crane forward to get a better view? Maybe you are wondering if you can stream videos onto something with bigger screen, like a TV through Apple TV. Sounds familiar? Yes, here you can learn how to airplay videos in any formats MKV, AVI, WMV, FLV etc that can be played on your computer to an Apple TV with 5KPlayer. Before you start to airplay videos, make sure your videos are AirPlay-compatible as AirPlay can only work with those files that can be added to iTunes including MP4, M4V, MOV, MP3, M4A and AAC. As for other formats like MKV, AVI, WMV, FLV, DivX, XviD, MPEG etc which are not supported by iTunes, AirPlay fails to handle either. To put it in another way, to successfully airplay AVI, MKV, WMV, FLV DivX files to Apple TV/Apple TV2/Apple TV3, you will need a DVD video converter software for Mac OS or Windows PC to convert those videos to AirPlay supported formats. Once you own an iOS device like iPhone, iPad and Apple TV, chances are that you have had a taste of the benefits brought by AirPlay, which is designed to help you airplay videos on your iOS devices iPhone, iPad to Apple TV. But how to AirPlay FLV, MKV, AVI, WMV and many more from your computer to Apple TV? This seems-to-be-impossible task remains a problem until 5KPlayer, a free yet professional video streaming software steps up to the plate. This AirPlay app allows users to AirPlay MKV, AVI, FLV, DivX, XviD, MPG, F4V, 3GP and other popular video formats after conversion from computer to Apple TV and other devices including your PC and Mac. Step 1: Download 5KPlayer on your Mac or PC, then launch it. Note: Your AirPlay video receiving device and 5KPlayer should be connected to the same WiFi network. Step 2: Click AirPlay button on the top right corner on the interface and you can see a list of airplay video receivers. Select Apple TV here. The AirPlay button will go red if it is enabled. 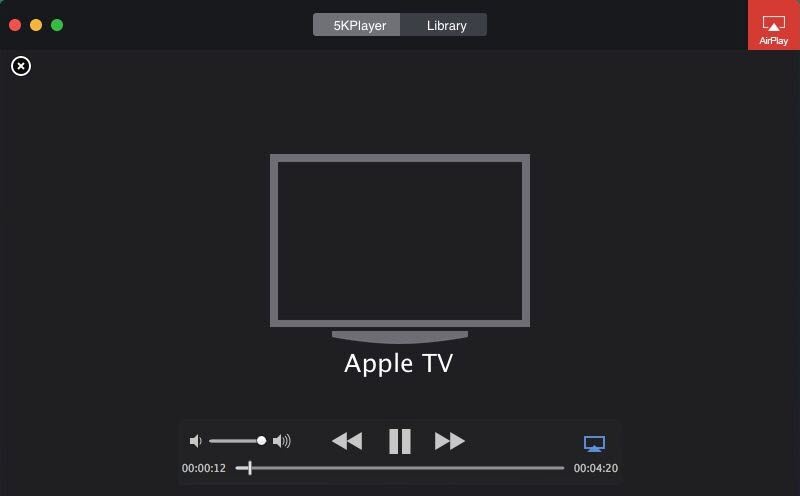 Step 3: Add the converted MKV, AVI, FLV or other videos or movies on your computer, it will automatically airplay to the Apple TV you connect. Serves as an AirPlay sender, 5KPlayer will AirPlay MKV, AVI, FLV videos on the larger screen and turn your computer to a media controller to exercise controls on your computer like fast forward, fast backward, zoom in and out and pause etc. Note: In addition to AirPlay videos from computer to other AirPlay-enabled devices, 5KPlayer also embraces the capability of an AirPlay receiver, which allows users to AirPlay video music from iOS devices like iPhone, iPod touch, iPad to PC or Mac. DearMob 5KPlayer is equipped with strong video and music AirPlay features. On one hand, it serves as an AirPlay sender, which allows users to AirPlay music and videos from computer to Apple TV; on the other hand, acting as an AirPlay receiver, it's also capable to stream video and audio from iPhone, iPad to Mac and PC. How to Use iPhone 6S Screen Mirroing? This screen mirroring iPhone guide also works for older iPhone 6/6 Plus and to mirror iPhone to Mac Windows.